This Item is No Longer Available. 537275703 has been superceded to 596297001. Designed for Brushcutters and Clearing Saws. Wide padded straps and wide back plate reduce the load on the upper body. 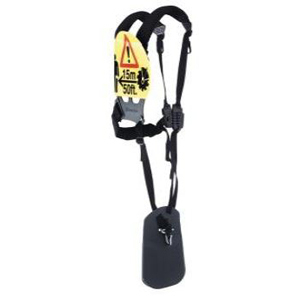 Equipped with a hip pad that has a traveling connection for maneuvering with minimum body movement. Simple and effective quick release on chest. Designed for Brushcutters and Clearing Saws. Wide padded straps and wide back plate reduce the load on the upper body. Equipped with a shock absorbing hip pad that has a traveling connection for maneuvering with minimum body movement. Simple and effective quick release on chest. product was backordered, but delivered before estimate. Ask us about the Husqvarna 537275703 Duo-Balance 35 Harness. Please no repair questions. Your Q&A may be posted to Jackssmallengines.com to help other shoppers, like you, with their purchasing decisions. Thank you.